There is obviously a lot of conjecture as to what the impact of the Fed embarking upon its first increase in short-term interest rates in over nine years will be. Markets are discounting mechanisms so what most people are talking about today the market often has moved on from awhile back. The spigot for corporate credit has been wide open since 2010…until now. And while many wonder if Fed rate hikes might harm the economy, I am seeing a few signs that the levee could be springing a few leaks which the Fed will have to contend with come hell or high water. The water levels have been rising and the levee may not be as strong as the Fed believes. There has been a lot of carnage in the corporate bond market that I think will have an impact on mergers and acquisitions activity and overall economic output as credit tightens up. Let’s look at a few charts to show what I am keeping an eye on. 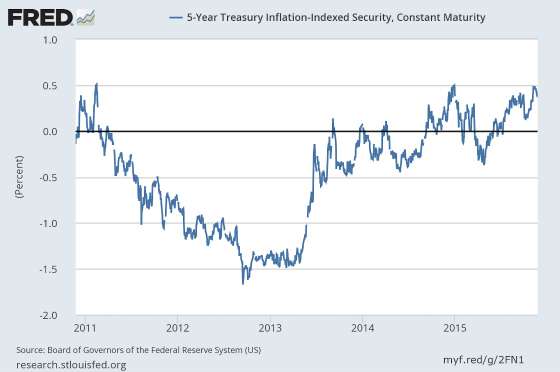 The first chart shows the real rate of return required by investors who purchase 5-Year Treasury Inflation-Indexed Securities. This is the return they get after inflation. In the last two years, there has actually been a pretty meaningful increase in real yields demanded by investors from an approximately negative 1.5% to a positive 0.5%, representing a 200 basis point tightening. The increase in real yields stems from higher risk-free Treasury yields, particularly on the short end as the following graph depicts. 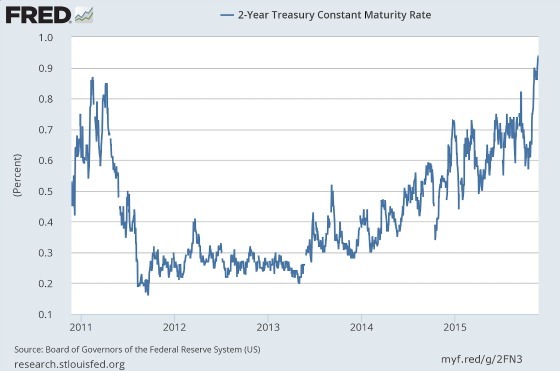 Since mid-2013 rates have been creeping higher and higher for 2-Year Treasuries with them moving ahead quite significantly over the last couple of months. 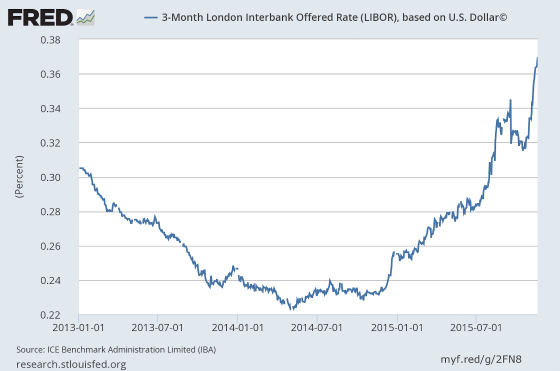 This has spilled over to even shorter rates such as 3-month LIBOR. 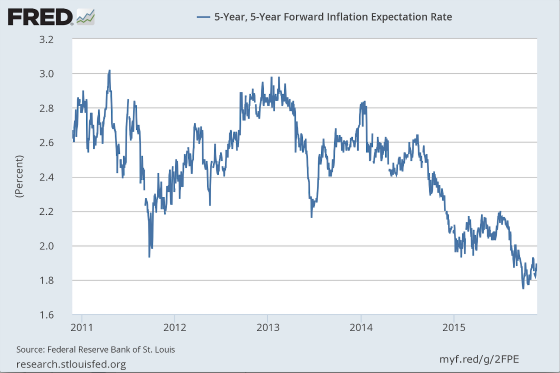 Meanwhile, despite the Fed having a stated intention of inflation reaching 2% before it starts raising rates, inflation expectations have been falling meaningfully as the following graph shows. The combination of higher Treasury rates and lower expected inflation has pushed up real returns as shown in the first graph. I think this already showing some negative repercussions as this increase in rates is having an effect in the corporate bond market, particularly on the lower end of the credit spectrum. 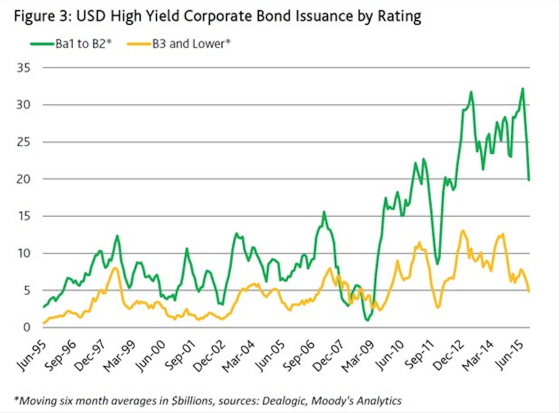 The chart above shows the yield premium required by investors to own the lowest-rated corporate bonds. The spike in 2011 was related to the Euro crisis which was more of an event driven reaction versus something more fundamental (easy to say in hindsight I know). After it subsided, yield premiums compressed quite dramatically. The grinding higher of rates since mid-2014 (one year later than when real rates started rising), however, is more pervasive and fundamental in my opinion. It is a sign of being in the late stages of a credit cycle. Why do I believe this? The following chart shows issuance of high yield securities and one can see how it exploded higher and now is coming back to earth. It’s very common for corporate credit conditions to tighten up quite significantly two to three years after peak issuance. 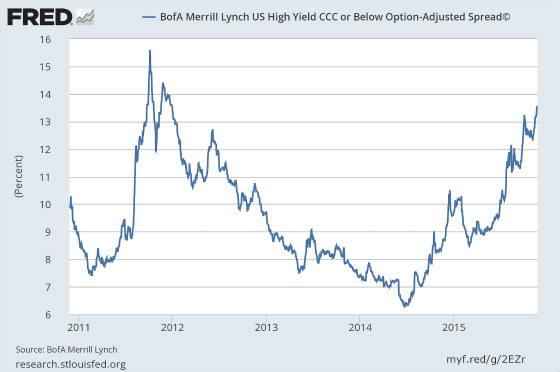 The junk bond market collapsed in 2001-2 and 2008-9 when the issuance of high yield bonds was much more subdued. Corporate credit has been available in large quantities for the last five years. Despite this, or because of this, the cracks in the levee are already starting to appear as depicted by the following chart. 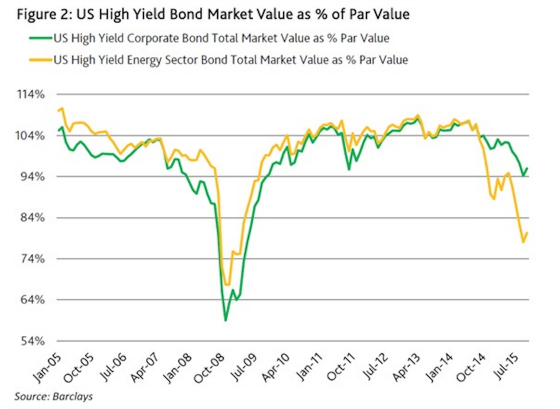 Many people have attributed the very weak performance of high yield bonds and leveraged loans to the energy sector. While this is true to a large degree, the chart above shows that non-energy credit is showing some material weakness as well with prices meaningfully below par and quite a bit lower than the peak. One never knows if this trend will continue or we’re approaching a bottom, but I am a bit skeptical for a couple of reasons. 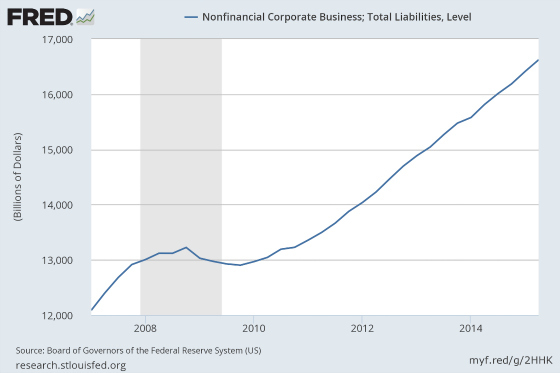 The first is the overall increase in liabilities in Corporate America that have been generated to fund share buybacks, dividends, mergers & acquisitions, and business expansion. This has grown quite significantly since 2010 as the following chart shows. Unfortunately when it comes to credit issuance eventually it can be overdone and when cracks appear in the creditworthiness of companies, then lenders pull back which can slow down economic activity and subsequently harm collateral values which can create more conservatism among lenders. It can become a negative feedback loop. 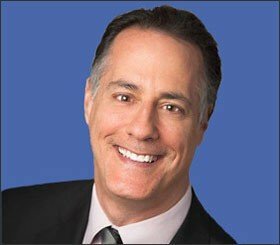 Asset values can drop precipitously while liabilities stay behind, thereby creating some powerful, unexpected reductions in corporate net worth. A very good leading indicator of future credit performance is the ratio of downgrades to upgrades by credit agencies like Moody’s and S&P. When downgrades of debt begin to exceed upgrades that is often an ominous sign, particularly when we are 6+ years into a recovery and we have had significant amounts of debt issued. For example, junk bonds have gone from about $944 billion in 2008 to over $1.8 trillion today. 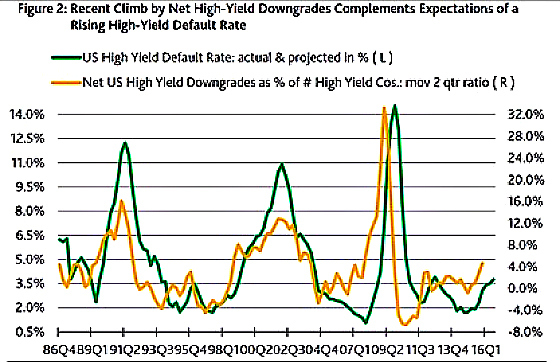 The following chart shows what is happening in terms of downgrades to upgrades and the high yield default rate. While the chart above does not show significantly higher downgrades than upgrades, the trend is not moving in the right direction and seems to be getting worse, along with the default rate. According to John Lonski of Moody’s Capital Markets Research, Inc who wrote the report this chart came from, “To date, the US high-yield credit rating changes of 2015’s fourth quarter show 57 downgrades far exceeding 18 upgrades. In addition, the accompanying revisions of investment-grade ratings include 11 downgrades and only one upgrade”. Each turn in the downgrade/upgrade ratio led to some deep problems in the high yield market and spilled over into the real economy via recessions and economic weakness in 1989-90, 2000-2002, and 2008-9. Whether economic weakness led to a tightening of credit or a tightening of credit led to economic weakness (I am more in the camp of the latter), the bottom line is that the end result was not pretty the last three times this ratio started increasing and default rates moved higher. And to think that the Fed is just going to start raising short-term rates. Stay tuned as 2016 should turn out to be a very interesting year. What happens if the levee breaks? Are you ready for 2016? Stay Tuned!